Another first??? I think so!!! Uh oh! Back at it. The juices have been flowing lately here's a teaser. More to come. So here is the view with the lights on. I'm retaining the orange so it blends with the rest of the interior. Sure I could convert all to white but I don't really like that. I want to have modified factory. Last edited by nevrdun; 02-01-2011 at 10:19 PM. Re: Another first??? I think so!!! Cant wait to see it finished. Props to you for having the balls to take your needles off, and disassemble the cluster. Major cajones indeed my freind. This is one of the mods I have done where I would feel pretty confident in coming up with a price. Im about 3hrs invested and it's all but wired. Lol, I work on stuff a WHOLE lot more expensive than a 14 year old Honda cluster. My tank is full and so all I have to really do is turn ignition on so everything is at and re insert the needles carefully. The needles are the only scary part tho. I did cringe a little when I took them off lol. And I run a drill bit through the transom of about 3 $50,000 boats a week in the summer. I've kinda acquired nerves of steel. I love it Jesse! This is something I've been planning on doing for years. Full write up when complete please. Thanks Colin and the rest of you guys. So far it's turning out just as I envisioned. Once I get the wiring figured out and executed I'll post a video. You guys are gonna $hit your pants when you see what's floating around in my brain. Yup, that's why I left some space available. So I hosed myself. I goofed up the leads on the bulbs using them as a dipping hook lol. So the parts store had one pair. Ill have to pick up a couple more tomorrow when others are open. I should have better shots of the "bench test" tomorrow night. Seriously! This is so awesome! 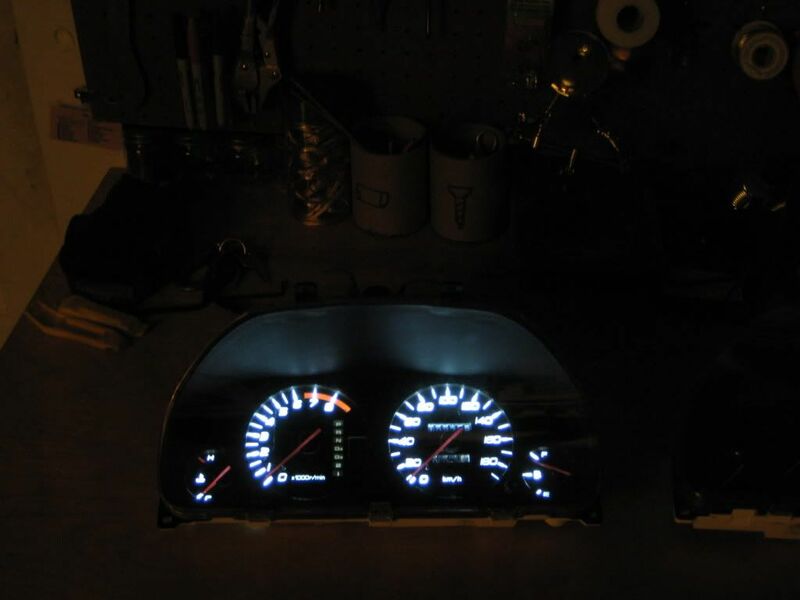 I have wanted for so long just to do the LED strips (there is a write-up somewhere) but I don't trust myself enough to take apart my gauge cluster! Ill keep everyone posted once I get it completed. Nice... heres a pic of the one I did for a guy. I also added the LED strips after scrathing off the amber background. BTW, it is possible to do this without removing the speedo and tach. It is necessary to remove the fuel and temp needles though. Really? How do you manage that? It was really tedious; remove fuel and temp needles, then carefully pry up the gauge faces. They are glued on, but it pulls up pretty easily. Then, you are able to rotate the gauge face around to different positions (while still held to the cluster by the larger needles). Working from the back, you use an xacto blade and lightly scrape off the thin 'amber' film. It takes a bunch of 'rotate-a-bit, scrape-a-bit' over and over until you make it all the way around. Obviously, if you have tools to set the tach and speedo correctly... your way is MUCH easier. But, it is possible if there is no access to the right tools... ya just gotta be careful the whole time. Ok, that's what I could have imagined. Tedious is definately the word for it. Well guys here is the update. I'm disgusted. I can't figure out the tach. I'm not one that is keen on ffailure but am just going to admit it. I will hook up the white lights to work when the headlights are off but will not be going to great lengths to make it cool. My original plan was to actually make each side of the gauges "pulse" for turn signals and eliminate the green indicators. Lots of tedious extra work for something I'm not going to keep. Time to start gathering some aftmkt gauges!